It’s been close to two months since we returned from our trip to India. While enjoying very much needed break with our family and friends, I managed to take few photographs of the amazing food we tasted coked by our loved ones. Ever since we returned from our trip I wanted to share the recipe with you, but little laziness and truck load of never ending tasks kept me away from writing the blog post. I know the posts have become a little irregular these days, and sadly it is going to be little erratic for few more months due to some life changing event taking place in our lives! Everything said and done, I don’t want to stay away from this virtual home for very long. So I will try and publish recipe posts as often as possible. 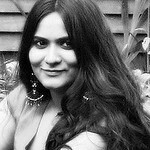 I may not find time to rant and ramble to my heart’s desire, but I sure will find time to post the recipes that we have cooked together and enjoyed tasting every single bite of mouthfuls with my dear readers. 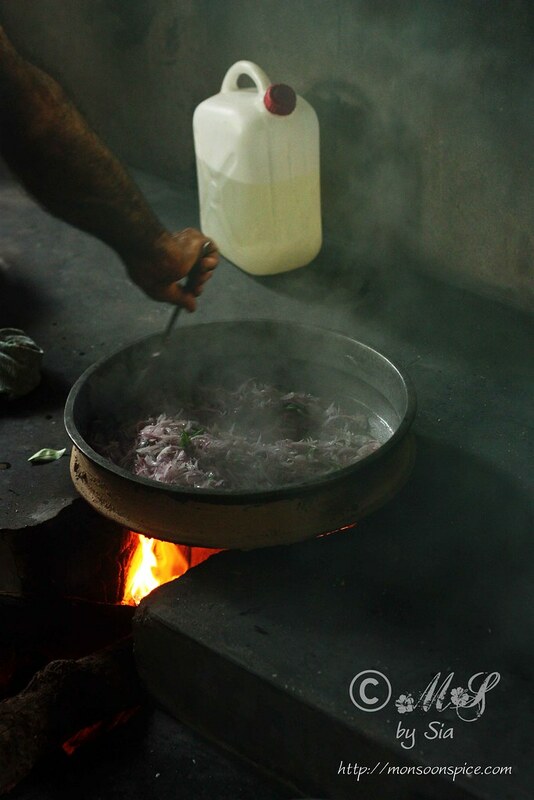 Although I haven’t picked the camera ever since we returned from India, I still have got quite a handful of recipes waiting to be posted somewhere in my external hard disk. And today I am sharing one such recipe, no, two recipes: Poori Bhaji. Poori/Puri ~ Puffed golden beauties! 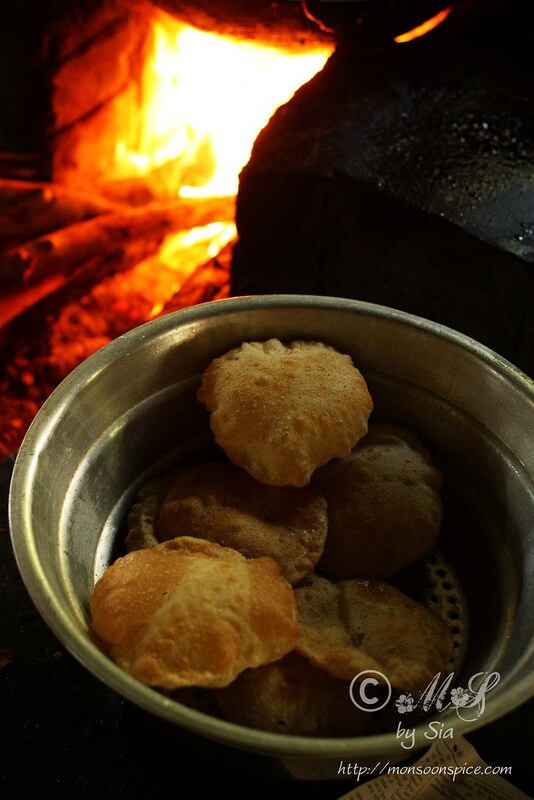 Poori Bhaaji is probably one of the popular and most loved food combinations in India. Poori is unleavened deep fried bread and is made of whole wheat flour. The whole wheat dough is rolled into small 5 inch circle and deep fried in a hot oil until it puffs up and turns golden yellow. 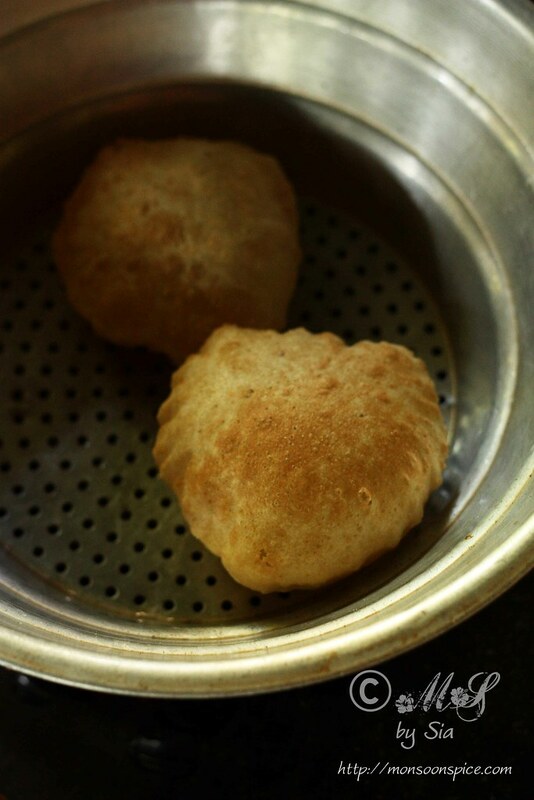 The simple science behind this puffed up Poori which resembles like a small round ball is due to the moisture in the dough that changes into steam which expands in all directs when deep fried. The most popular choice to accompany this deep fried delight is a simple vegan curry of potato called Potato Bhaji or Aloo Bhaaji or Poori Masala. 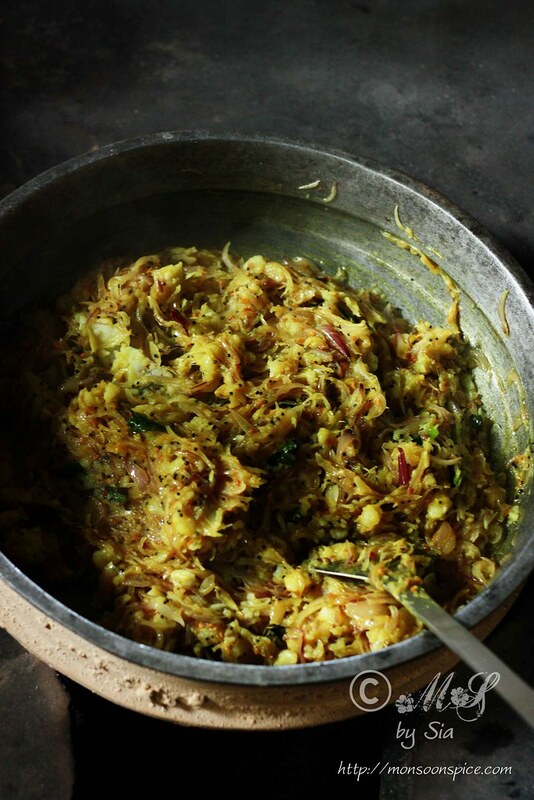 Roughly mashed boiled potatoes are cooked along with fried onions and few selected spices. Aloo Bhaji or Potato Bhaaji is one of the most simple, easy to follow recipe, but it is also one of the best tasting dish that goes well with Poori, chapatti and dosa. Other popular dishes served with Poori are Vegetable Saagu, Kurma, Chana Masala, or Chole and also the sweet dishes like Kesari Bhath, Pineapple Kesari, Halwa and Shrikhand for those who have big sweet tooth! 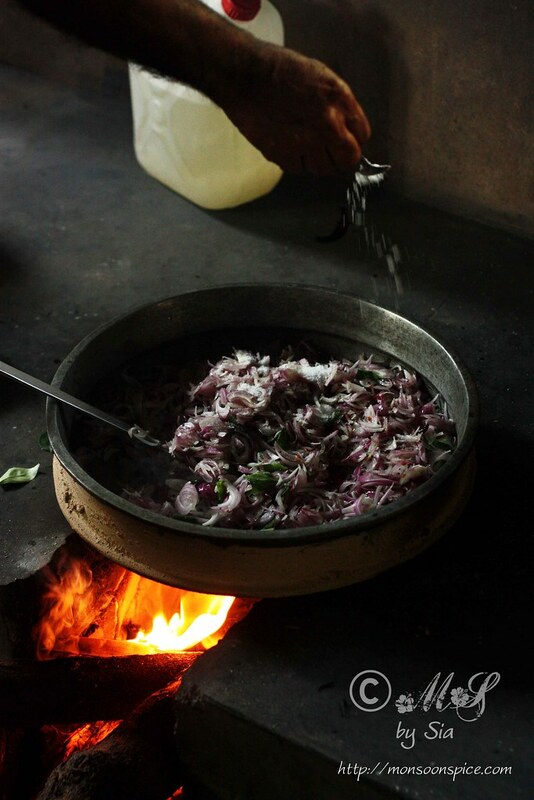 Heat oil in a wok or kadai for deep frying on medium flame. While the oil is getting heated, take whole wheat flour in a large mixing bowl. Stir in salt and mix them well. Add little water at a time as you knead. Make sure that the dough is not too dry or wet. Adjust the quantity of water to make soft pliable dough that doesn’t stick to your hand or bowl. 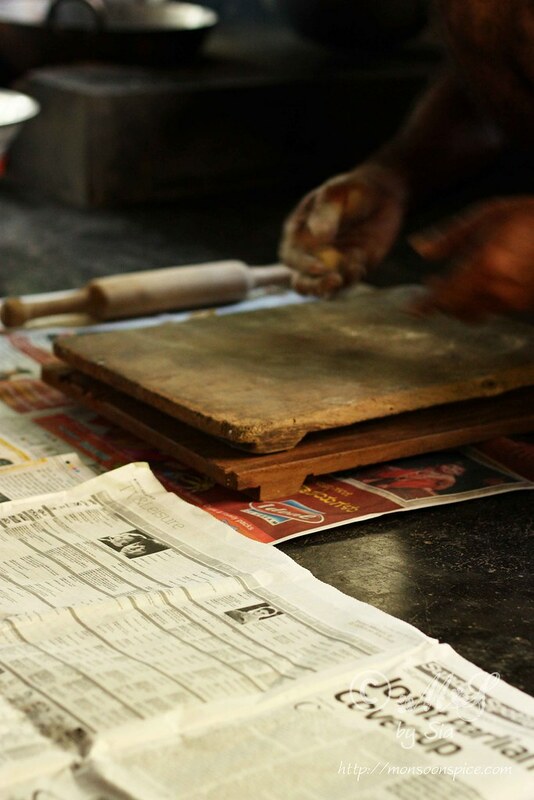 You can also add about 1 tbsp of hot oil to the dough when kneading which helps in making smooth dough. Pinch small lime sized dough and roll them in to small balls. Cover the bowl with towel to help in preventing the dough balls from drying out. Lightly dust the surface and the rolling pin with flour and roll the dough balls into circles of about 5-6 inch in diameter. 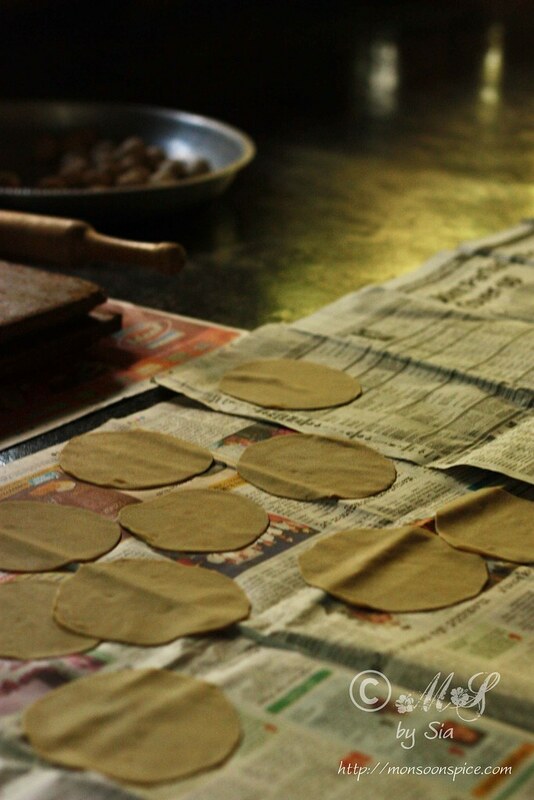 Don’t roll them too thin as the Poori will not puff up when deep frying. They should be about 3-3½ mm thick. Roll out 4-5 Poories at time and cover them with a kitchen towel. Check if the oil is hot enough for deep frying by dropping a small piece of dough into the oil. If the dough fries up and floats to the surface immediately, then the oil is ready for deep frying. If the dough sinks to the bottom of the pan, then the oil is not heated enough for deep frying. 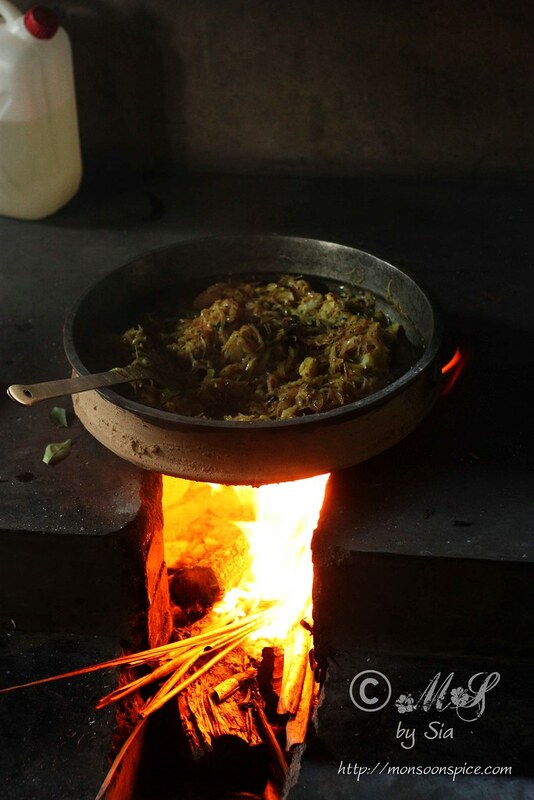 Remember not to heat the oil to smoking hot as this will burn the Poori. 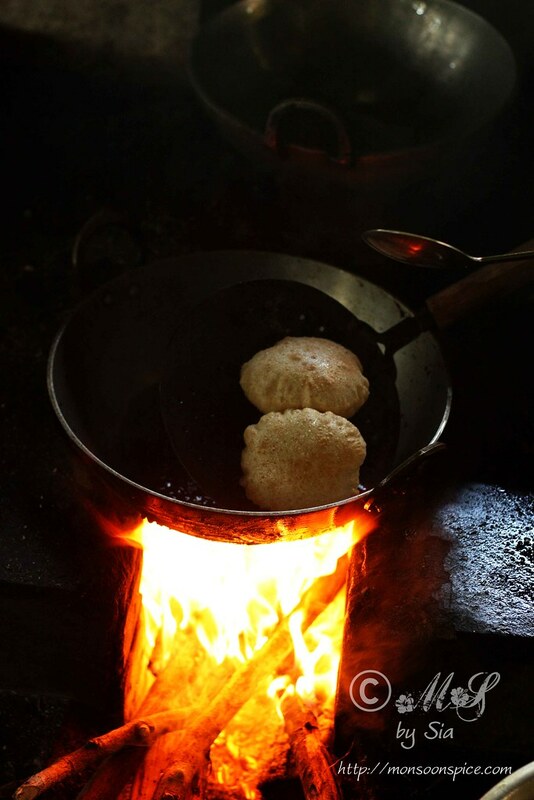 If the oil is not hot enough, the Poori will not puff up and you will end up with a dry, flat Poori. Drop the rolled out dough into the hot oil carefully. Deep fry one Poori at time. 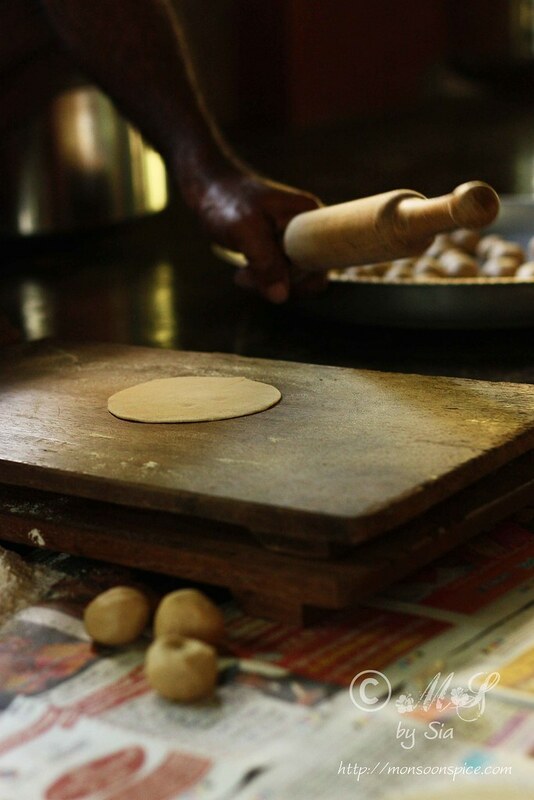 Lightly press the Poori with a slotted spoon when it tries to float to the surface. This helps in puffing the Poori. Turn it and let it cook on the other side till it turns golden yellow. Take out the hot puffed Poori with a slotted spoon and place it in a bowl lined with kitchen towel to remove excess oil. 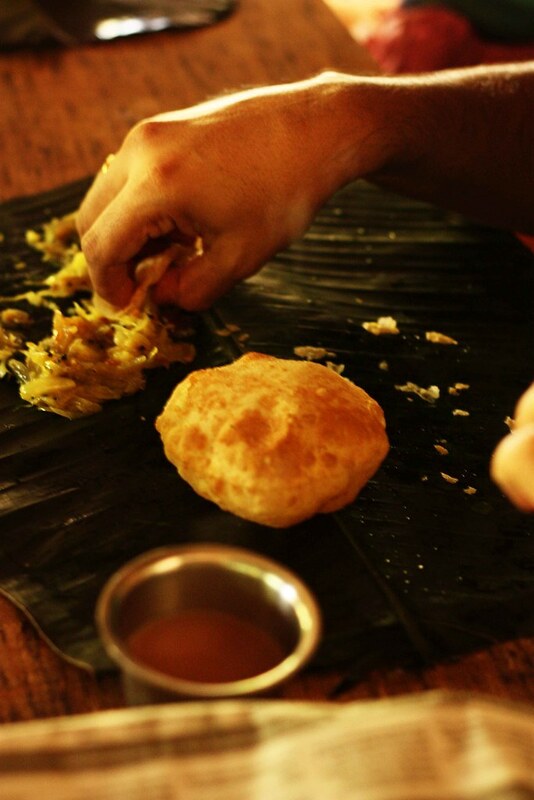 Continue to roll and cook remaining batch of Poories one at a time till you get a puffed up golden Poori. Serve these delicious Poori with Aloo Bhaji (following recipe), Vegetable Sagu, Channa Masala, Veg Kurma, Chole or any Curry of your choice. It also goes well with Kesari Bhaat, Pineapple Kesari, or Srikhand. 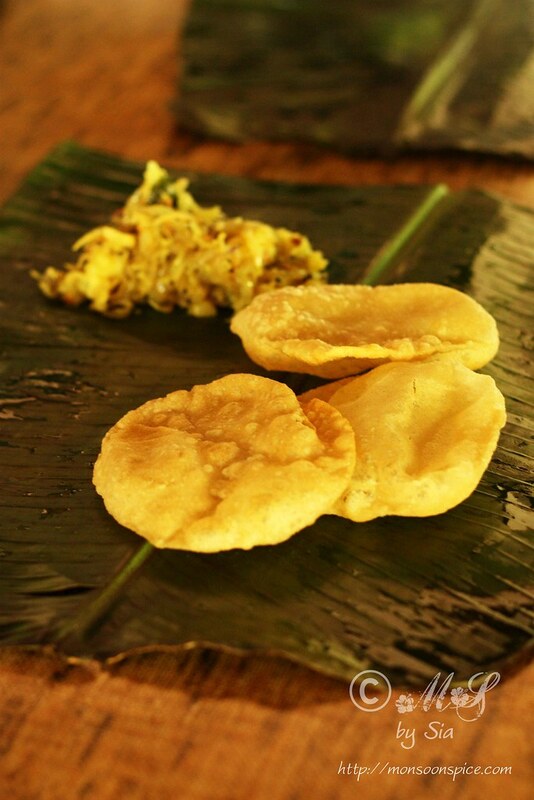 Our cook suggested adding a tbsp of fine semolina or rava when making the dough as it makes the Poori crispier. 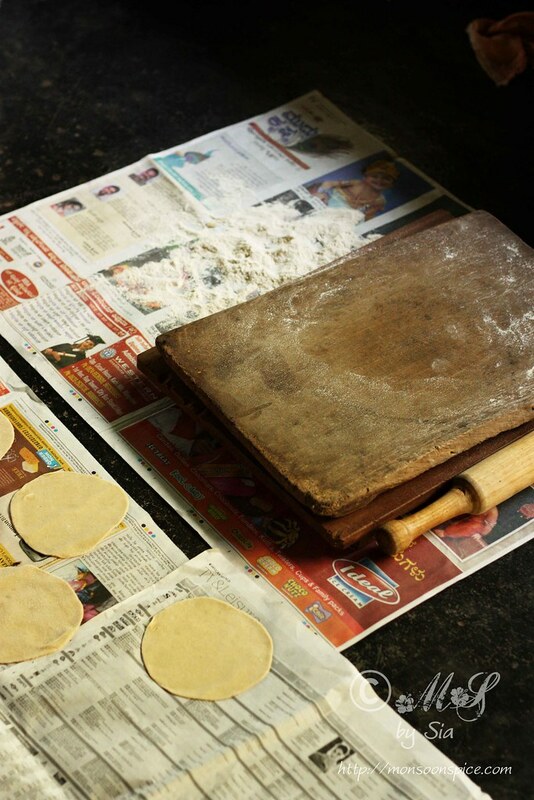 You can also add a tsp of sugar when making dough as it will give nice golden red colour the poori when deep frying. Add little water at a time as you knead. Make sure that the dough is not too dry or wet. Adjust the quantity of water to make soft pliable dough that doesn’t stick to your hand or bowl. You can also add about 1 tbsp of hot oil to the dough when kneading which helps in making smooth dough. 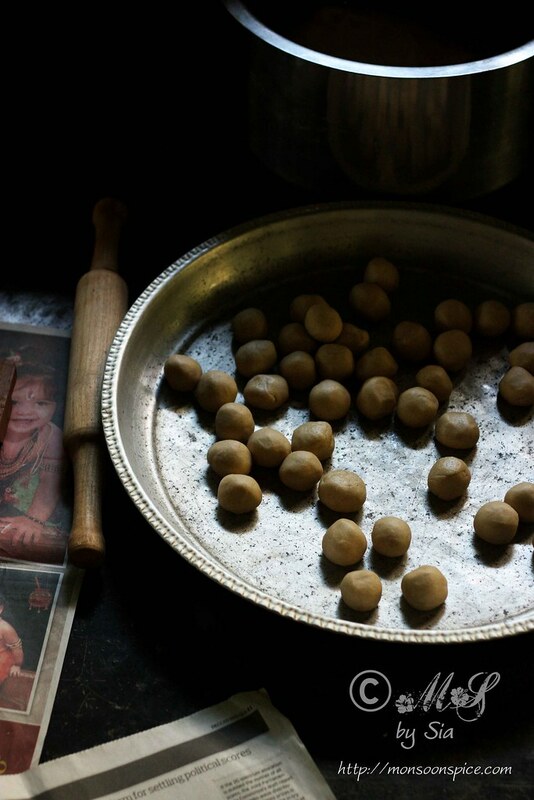 Lightly dust the surface and the rolling pin with flour and roll the dough balls into circles of about 5-6 inch in diameter. 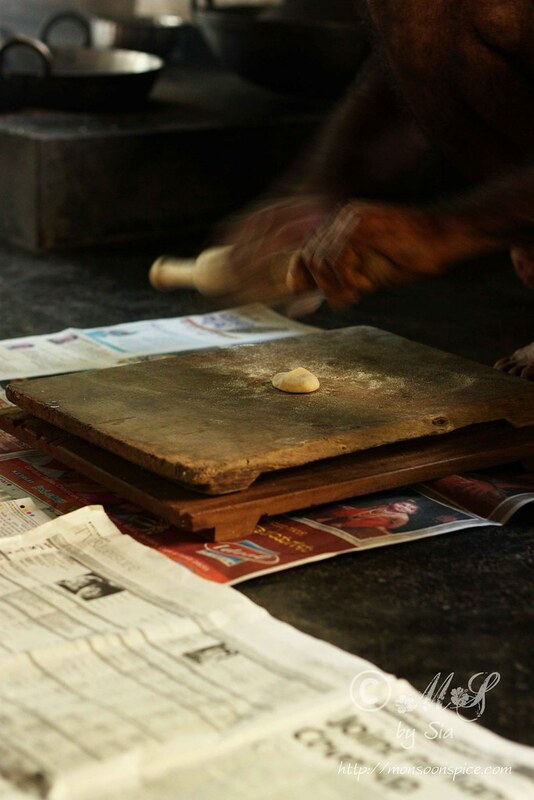 Don’t roll them too thin as the Poori will not puff up when deep frying. They should be about 3-3½ mm thick. Bhaaji is ready to serve! Delicious Potato Bhaji or Aloo Bhaaji or Poori Masala ready to serve! Cook potatoes with skin in a pressure cooker (read notes). Once cool enough to handle, peel the skin and roughly mash them. Make sure you don’t mash them completely, just break them into small chunky pieces. Keep them aside until needed. 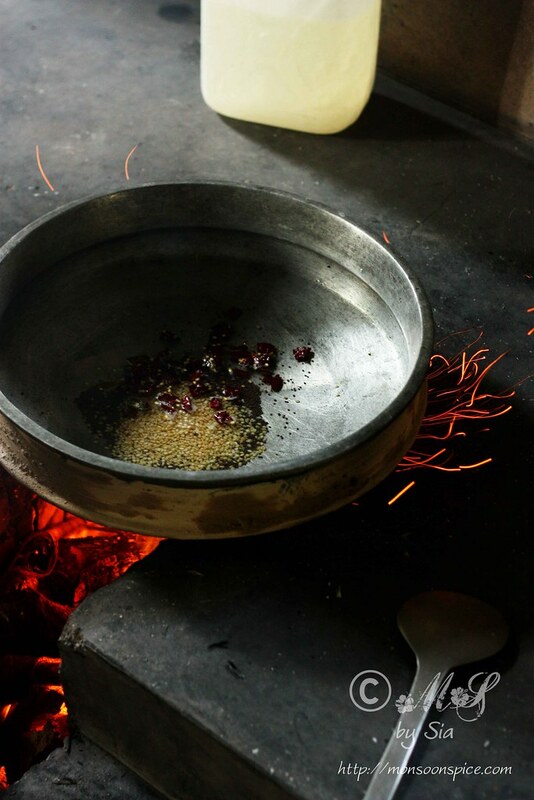 Heat oil in a pan or wok and add mustard seeds, urad dal and dry red chillies. When urad dal turns golden red and mustard seeds start to pop and splutter, add hing, curry leaves and slit green chillies and sauté it for few seconds. 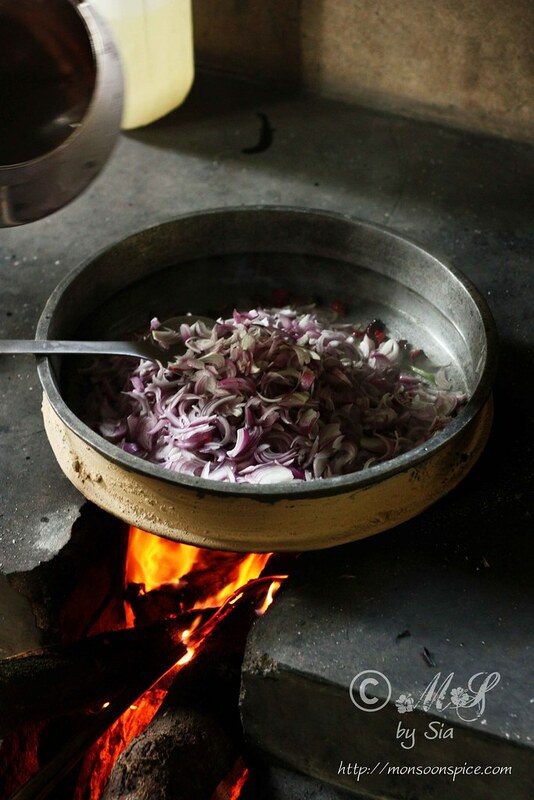 Mix in thinly sliced onions and fry them on medium heat for 2-3 minutes. Add finely chopped ginger and turmeric powder and fry them for a minute. 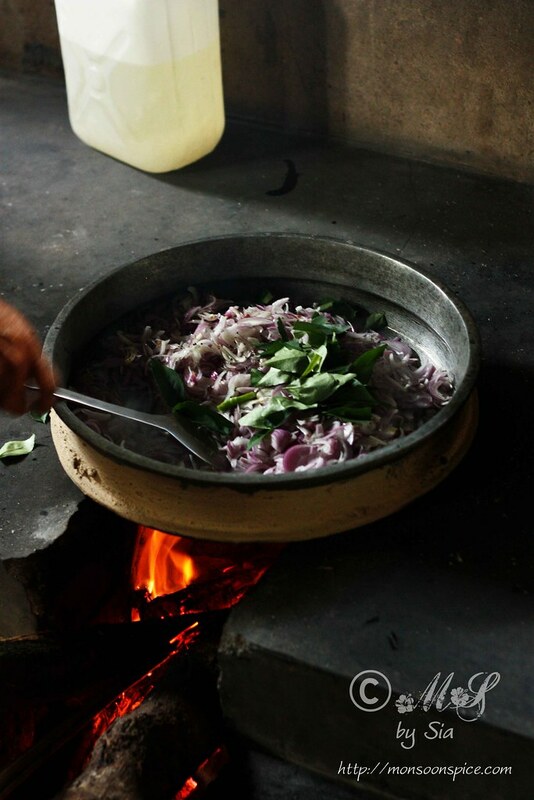 Add about 2½ - 3 cups of water, jaggary and salt to taste and bring the whole mixture to boil. Once the water comes to boil, add mashed potatoes and mix them well. Adjust the seasonings and let the mixture cook for 4-5 minutes. Serve this delicious Aloo Bhaaji or Potato Bhaaji or Poori Masala with hot Poories and enjoy! Poori Bhaji ~ A perfect breakfast! You can also add carrots and green peas in this Masala. Chop the peeled carrots into small cubes and cook or steam them along with green peas and add along with mashed potatoes when making Poori Masala. You can add 2-3 tbsp of finely chopped coriander to garnish the Aloo Bhaaji. The best way to cook the potatoes is in pressure cooker. To cook in a pressure cooker, place the scrubbed and washed potatoes in a container and place it in the pressure cooker with 1- 1½ inch high water in the pressure cooker. Do not add any water to the container with potatoes. Cover the cooker with lid and place the weight/whistle. Cook the potatoes on high flame for 6-7 minutes or 2 whistles. Lower the flame and let it simmer for another 7-8 minutes before turning off the gas. The large potatoes will take little longer to cook. Let the pressure release completely before opening the lid. Check if the potatoes are cooked through by inserting the sharp knife or fork. Once the potatoes are cool enough to handle, peel the skin and dice them in to 1½ inch cubes. Do not rinse the hot potatoes under running water or cold water as the potatoes will turn soggy. You can also serve this Aloo Bhaji or Potato Bhaaji or Poori Masala with chapatti or dosa. 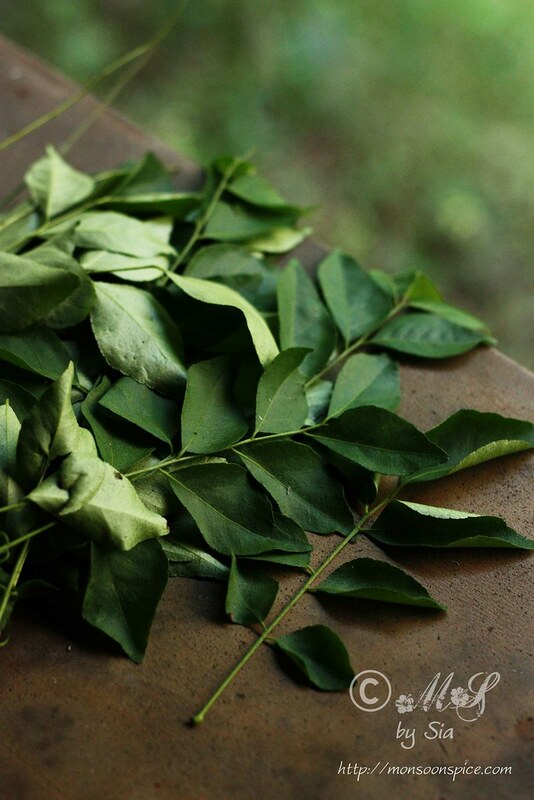 i love how rustic the photos are! Fantastic food! I'd love to cook food in that way. Traditional ovens are awesome. Wonderful pics and narration. Yummy! Poori bhaji looks lovely with nice step by step clicks. 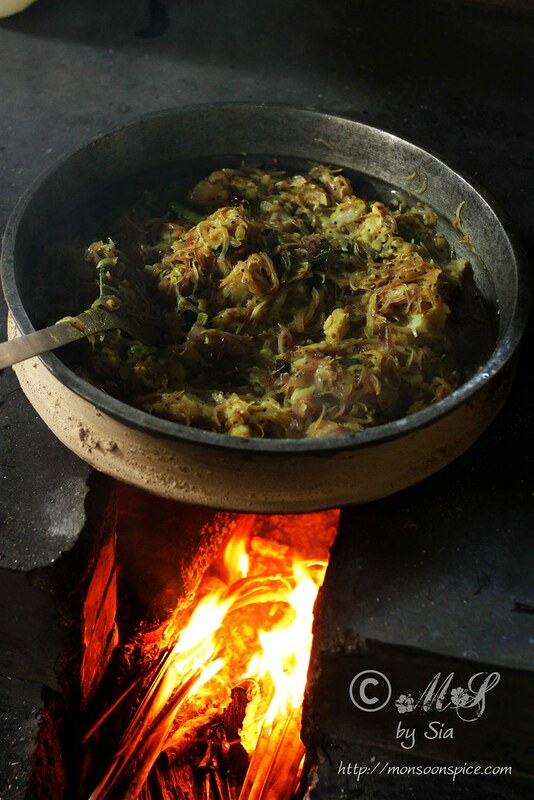 I love the clicks ..I am sure there is something about that smoke getting infused in the dish..I love the bhaji utensil. 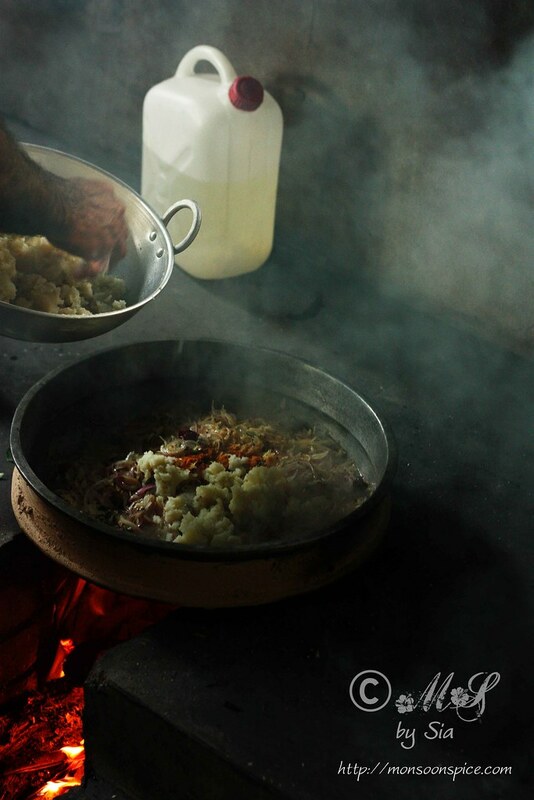 Gorgeous pictures..love the rustic kitchen!